What's up? Heidi in a gallery for contemporary art? She is the most widely read book from Switzerland, translated into more then 50 languages, filmed over a dozen times and retold in countless TV series and comic books. Commercially she is over baked: from Heidi Water to Heidi Country. This immortal masterpiece of children's literature is a curse that has turned our country into a stereotype and we can only shake our heads while trying to explain this anachronism to foreign visitors. Excuse me: we can’t – we must! Yes, it has become a reflex to explain to tourists that Heidi and modern Switzerland have nothing to do with one another. Yes, we are insulted by these Heidi inspired tourists. All of them are deluded seekers who long to romanticize goat herders and illiterates. We are not this way and we were not this way, when Ms Spyri printed her book in 1880. Either you look away from the unenlightened tourists revealing smile. Or you take the money out of their pockets. It is money from the un-teachable. Or maybe you just want to satisfy your more base motives such as revenge or greed. The tourists have also heard about the money. Some do appreciate modern Switzerland. They happily hoard and manage their assets here, when the Swiss banker says: "In gold we trust." But even these modern people have the Heidi myth instilled in them during childhood; either having read or saw the Heidi saga with their families and then after having visited the Zurich parade grounds, traveled into the mountains where she greets them at a hotel or home. They like to spend their valuable time in "Heidi Wonderland." Why? Why is Heidi more known than Roger Federer? Because Heidi embodies a timeless figure who, even in difficult times, had her heart in the right place. Heidi is not a withdrawn mountain creature that refuses social change. Heidi travels abroad (to Germany) and learns to read there, because she recognizes the challenges of modern life with open eyes. She takes the good things of industrialized society, but denies those new conventions, which she regards as a nonsensical fashion or a dehumanizing force. She rebelled against everything that she thought rejected nature and uprooted people. She is a grounded citizen of the world, whose core is incorruptible. Unlike her friend, Peter the goat herder, who is afraid of everything strange and new, and therefore not ready to learn to read or to expand his horizons. Our Heidi takes this hardened mountain boy and open his heart up and allows him to follow her life philosophy. Her intuitive wisdom also gives new legs to a handicapped child from the big city. Her insistence to help third parties is based on the infallibility of Heidi's soul, which is guided and nurtured by her connection to nature. Heidi is incorruptible and thus has a timeless character that every child understands and accepts as a moral role model. We should not fight this image of our country, but preserve it. This must also include the stereotypes and romantic illusions. So if there is a visual representation, it is the critically branded tourist kitsch adaptation of "Heidi and Peter" (1955) directed by Franz Schnyder. 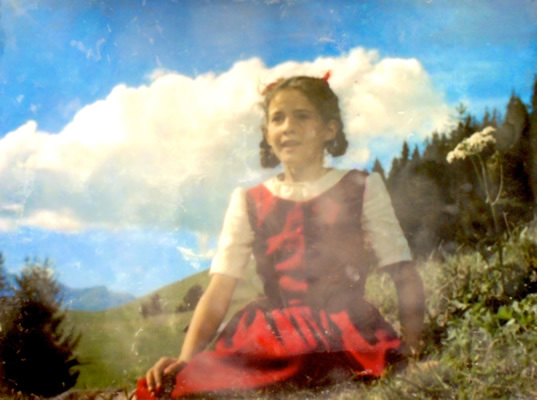 Schnyder's film draws the nature of the character Heidi, staged as a dance on a postcard image and turned it into a film that corresponds to the heart of the novel. The integration of the main characters in the romanticized landscape works perfectly and the aesthetics of the Technicolor generates an exaggeration of romanticism. It is unreal and dreamlike. The pictures are reminiscent of the paintings of the Impressionists, who - like Schnyder - harbored the intention of leading the eye more differently than usual, so as to create new worlds of vision. Combining the best stills of the film with the unique wax technique of the artist Patrick Lo Giudice, this effect is multiplied. Because the wax is applied in layers, the image is blurred and with depth, so that a new aesthetic discloses an exaggeration of an exaggeration, so to speak, with each layer of wax to wax the eye and the heart of the beholder is charmed: Heidi Wonderland precisely.